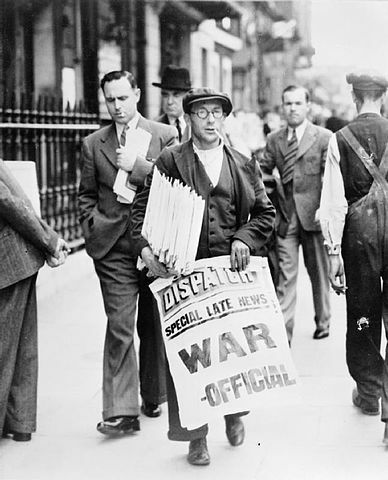 The Phoney War was an a period of time at the beginning of World War II in which no fighting occurred between Nazi Germany and Britain or France. World War II began on September 1st, 1939 when Germany invaded Poland. Although, Britain and France declared war against Germany a few days later, no fighting occurred in Western Europe until Germany's invasion of France during the Battle of France in May of 1940. The 8 month period of the Phoney War was marked by a few key events that would help set the stage for the remainder of World War II. For its part, Germany spent the early part of the Phoney War unleashing its blitzkrieg tactics against Poland. As well, German u-boats began participating in the Battle of the Atlantic, which was a series of naval battles between Germany and the Allied powers in the North Atlantic. Finally, Germany began to reinforce its border with France in preparation for the future battles that would occur. Meanwhile, Britain and France began to deploy troops to the Maginot Line to build up the defenses of France. Also, both Britain and France began to purchase munitions from the United States in order to quickly build up their supplies. Finally, the Phoney War saw Britain undergo a political change when Winston Churchill replaced Neville Chamberlain as the Prime Minister of Britain. The Phoney War ended in 1940 when German troops pushed through the Ardennes Forest and defeated Belgium and France.